Kenya safari tour encountering wildlife, scenic and cultural highlights in a 12 days tour package that includes private vehicle transport, game viewing drives, stops at attractions, park entrance fees and accommodation in a choice of economy,standard or luxury safari lodges & tented camps. 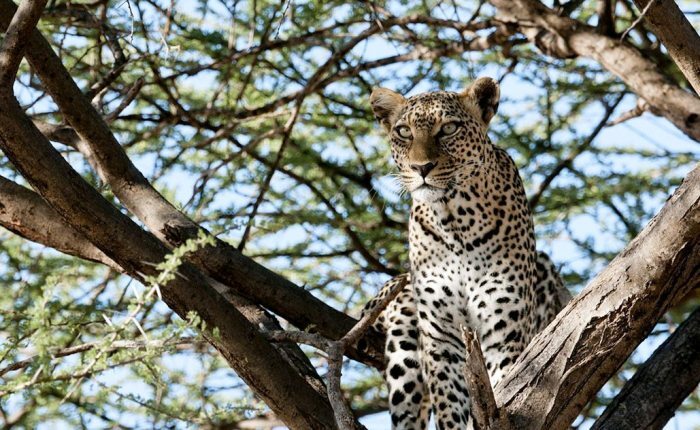 The Kenya safari tour visits Samburu Game Reserve, Mount Kenya, Aberdares National Park, Lake Nakuru National Park, Masai Mara Game Reserve, Lake Naivasha, Amboseli and the Tsavo West National Parks. Tour departs Nairobi with an option of finishing at the Kenya coast beach resorts of Mombasa, Diani, Watamu or Malindi. 4 x 4 land cruiser safari jeeps are an option at supplementary cost. • Tsavo west national park,1 night. • Awesome scenery along the safari route. • Blend of local cultures and people including the Masai, Samburu, Redille etc. • Elephant, oryx, giraffe, lion, ostrich, cheetah, warthog, flamingoes, pelicans etc. 0730hrs: Pick up from your Nairobi hotel or Nairobi airport . Depart Nairobi and proceed to the Samburu game reserve. The scenic drive is via the Kenya highlands with views of tea, coffee and subsistence farmlands. Day shall be spent at the Samburu game reserve with game viewing drives. Options of combining the Samburu,Buffalo springs and Shaba reserves Game viewing concentrates along the Ewaso Nyiro River which is the lifeline of this semi desert environment. Overnight at your Samburu lodge or tented camp. Early game viewing drive at the Samburu game reserve. Later depart for the cooler Mount Kenya region at the shadows of Mount Kenya. Afternoon optional activities depending on your safari accommodation preference. Mount Kenya safari club: Relaxation and optional activities at the exclusive club Sweetwaters tented camp: Game viewing drives at Olpejeta sanctuary. Mountain lodge: Game viewing from the tree lodge or optional nature activities. Overnight at your mount Kenya safari lodge/ tented camp. What you may see / do around Mt. Kenya National park ……Elephants, Tree hyrax, white tailed mongoose, black fronted duiker, mole rat, bushbuck, water buck,Elands,rhino,cheepanzee . Morning shall be spent with optional activities depending on your choice of accommodation at Mount Kenya. Later proceed to the Aberdares National park . Afternoon transfer to a tree hotel. Overnight at your tree lodge with game viewing from the balconies of your cabin. What may see/ do at Aberdare National park …………..bird watching, game viewing and photography. NB: Only small overnight bags are allowed at the tree hotels. The drive via farming country and homesteads via the Great Rift Valley escarpment edge is scenic. Afternoon bird watching and game viewing drive. The lake Nakuru national park is home to hundreds of thousands of flamingoes and other bird species. The lake also hosts the black and white rhinos in its sanctuary. Overnight at your lake Nakuru lodge or tented camp. Morning bird and game viewing drives. Proceed to the Masai Mara game reserves with stops at scenic points. Afternoon game viewing drives. Overnight at your Masai Mara safari lodge or tented camp. Today shall be a game viewing extravaganza! Masai Mara Game reserve remains the most exciting wildlife eco-system . It is host to the highest and most varied concentration of wild animals than any other wildlife park in the region. The scenic appeal of the tree studded savannah plains, the moderate climate and diversity of wild game species makes it a one stop shop for game viewing activities. Game viewing drives at the Masai Mara. Later depart the Mara for lake Naivasha. Optional bird and nature walk at the lodge gardens on the shores of lake Naivasha. Proceed to the Amboseli national park. Arrive at in time for an afternoon game viewing drive. Overnight at your Amboseli lodge or tented camp. Day 10: Amboseli National park. Day spent at the Amboseli national park with game viewing drives. The national park is small and compact. The mount Kilimanjaro on a clear day provides a dramatic background for wildlife photography. Overnight at your Amboseli safari lodge or tented camp. Morning game drive at the Amboseli. Proceed to the Tsavo West. Scenery and game viewing drives at the Tsavo west. Overnight at your tsavo west safari lodge or tented camp. Game viewing drives at the Tsavo west. Visit the Mzima springs to view hippos, crocodiles and exotic fish. Later depart for Nairobi or proceed to Mombasa and Kenya coast beach hotels.